High Sierra is a company that isn’t quite as popular as some of the higher priced brands out there, but they’re quickly gaining a reputation in the industry for their innovative line of hiking gear that’s built extra-tough. Their packs are often purchased by more serious hikers who need high capacity gear that will be able to withstand a wider range of weather conditions, not to mention, frequent, rough use. The pack we reviewed here is designed for longer use, and it can easily keep you well prepared for several weeks of trekking, mountain climbing, hunting or camping. We love that while priced affordably, this pack still comes equipped with plenty of features and storage space that you normally wouldn’t expect to find on such a reasonably priced hiking pack. The High Sierra Long Trail 90 backpack offers a large load capacity which will easily store all of the important gear that your next backpacking trip requires. Thanks to the wide range of features and affordable pricing, this will soon become your go-to pack for a wide range of applications. This pack offers a ninety-liter capacity and comes with dual contoured aluminum frame bars that will mold to your back perfectly. It’s also available in four color options including black, green, navy, and mercury. The Ergo-Fit shoulder harness complete with adjustable load lifters is made from Vapel mesh and features high-density foam padding. The back panel is made from molded foam and comes with airflow channels that work to keep you cool and dry during the hotter months. The main top loading compartment features an adjustable top lid and gusseted drawstring closures. The separate bottom sleeping bag compartment is perfect for storing a bag or smaller items you want to keep secure. The zippered divider will also allow you to quickly access items that are located in the bottom of the main compartment. If you’re going trekking for several weeks, you can attach a sleeping bag to the exterior of the pack and take advantage of the extra room available in the main compartment, leaving the divider unzipped. Just looking at all these features, it’s no surprise that this pack is a very practical buy. A lightweight pack that’s comfortable and loaded with features, you can be sure that the gear you’re carrying will be kept compact and safe and you’ll be able to carry it at full capacity without a lot of effort. The dual contoured aluminum frame bars are probably one of the greatest things about this pack. Because of the frame shape, you’ll easily be able to fit the pack to the shape of your back in order to carry a heavier load with ease. The Ergo–Fit shoulder harness features adjustable load lifters for optimal load support. Combined with the innovative frame design, you’ll no longer have to worry about shoulder, neck or upper back strain that can occur if the pack is loaded incorrectly, to capacity, or if the load shifts as you move. Long hikes in rain or snow can definitely cause plenty of wear and tear to your bag and your gear inside it. However, you won’t have to worry about water damage with this pack. The sides and top are equipped with mini-weave Duralite and ultra-durable grid weave Duralite, both of which are designed to withstand anything nature can throw at it. The bottom of the bag is made from even tougher Duraweave, so you can be sure that even with rough use the bottom of your pack will remain intact. 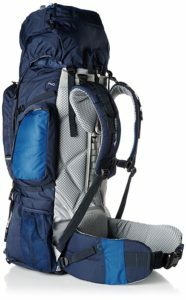 Pros: The thick back panel and Ergo-Fit shoulder harness make this pack incredibly comfortable to wear, even on longer hikes. The way the strap system comes up around the back of the neck adds much-needed support, while also promoting excellent weight distribution. While not totally waterproof, the pack is water resistant and can withstand moderate showers without the use of a rain cover, preventing your gear from getting soaked. The bottom compartment is so large you’ll be able to fit a sleeping bag, an extra layer of clothing and other small supplies. The front facing zipper opening is an excellent feature that gives the user fast, easy access. Because it’s not a heavy pack, the overall weight won’t affect the amount of gear you want to take on your trip. It’s also a very durable pack that can actually be used for a month long trip if you’re a decent packer. Because it’s made from strong, high-quality materials, you’ll be surprised at how long this pack remains looking new. It’s also a more affordable hiking pack option. For the quality, this model is very easy on your wallet. The backpack also comes with pockets in almost every possible location including the bottom, back, and front, allowing you to stay highly organized even during longer treks in the backcountry. Cons: Some hikers reported that the hip straps run a little large for wearers with a waist of thirty-four inches or less. 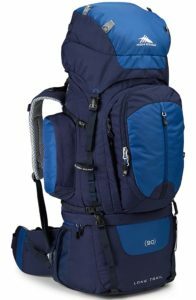 The Osprey Aether 60 hiking backpack can offer a better fitting hip belt and offers a comparable amount of carrying capacity as this High Sierra model. The High Sierra Long Trail 90 hiking backpack is perfect for hikers looking for a large capacity model. It features more than enough storage space in the main compartment and comes loaded with pockets, loops, straps and other attachment options so you won’t have to leave important gear at home. The pack is large enough to easily accommodate a small tent, sleeping pad, clothing, food, and water with no problem. It’s also highly breathable, making it a good choice for hikes in warmer months, yet weatherproofed and durable enough to take on an excursion in fall and winter. Overall, it’s a well-rounded hiking backpack that has a lot to offer in terms of usability, storage, and functionality.